This is a short report on how to connect Quick2Wire’s analogue board directly to a Raspberry Pi. 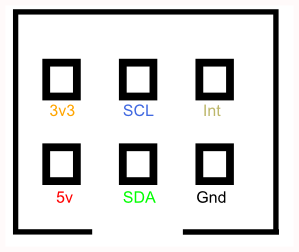 The key is the pinout for for the six-pin boxed headers on the Q2W board. I ignored the 5V and Int lines, running lines only for 3.3V, GND, SCL, and SDA. I ran these to the corresponding pins on the Pi, then executed sudo python3 pcf8591read.py as before. Result? Success! I could read the potentiometer connected as in my previous post on the Q2W analogue board. See that code for comments on the Python code used to read the potentiometer. 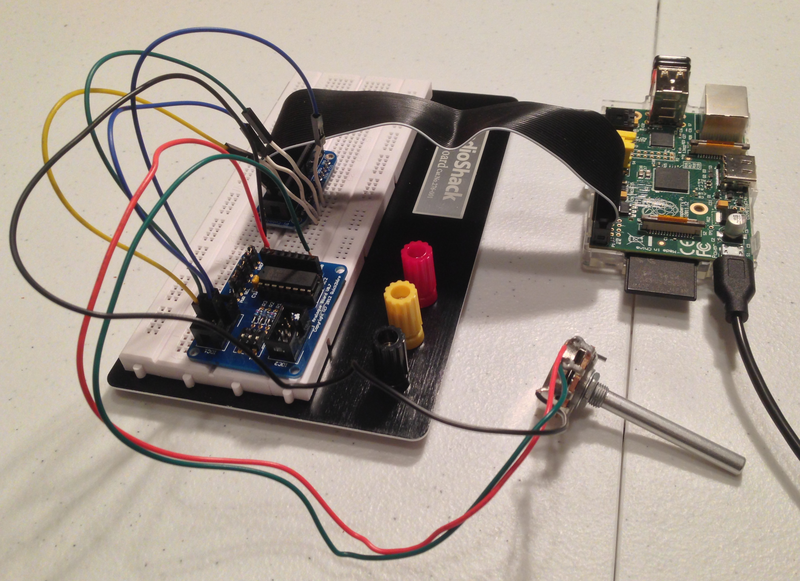 Below is an improved set-up for connecting the Quick2Wire analogue board to the Raspberry Pi. I mounted the Q2W board on one end of a full-size breadboard with double-sided tape and inserted a Pi Cobbler on the other end. 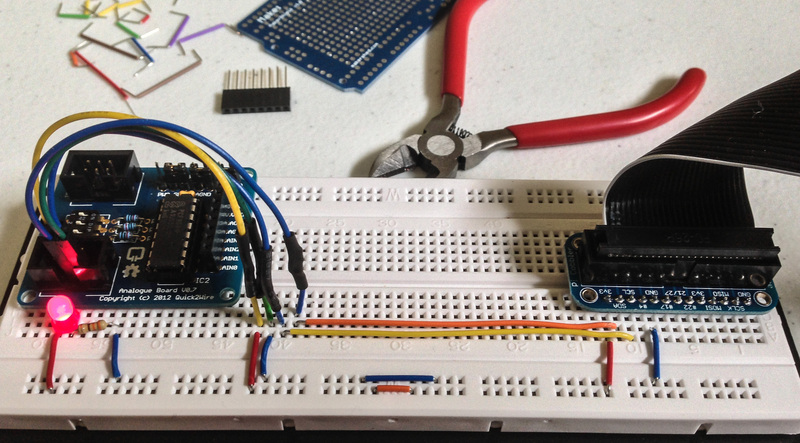 The analogue headers of the Q2W board face the inside of the breadboard. I didn’t have the right kind of jumpers to connect the Q2W board to the breadboard, so I cut one end off of each of four female-to-female jumpers, soldered on a length of wire, and sealed the exposed connection with heat-shrink tubing. We don’t want any short circuits! With the female-to-male jumpers in had, it ws easy to set up the circuit. 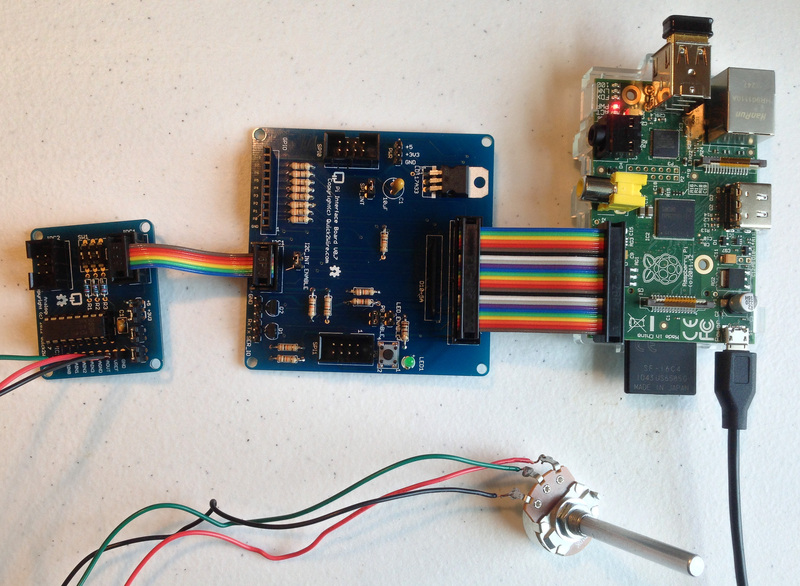 Edit: On the first try, the RPi could not read data from the Q2W board. I then remembered that the left and right halves of the board are electrically separate, so I installed the red and blue jumpers you see in the center, bottom of the photo below. I also added the little LED circuit you see in the lower left, so that there is an LED to indicate whether the full board is receiving power.